David L. Tyler, Alaska State Fire Marshal "In writing 'Fire and Ice: Tales from an Alaskan Volunteer Fire Chief' Chief Whetsell has done an incredible job of combining experience, wisdom and wit. It doesn't matter if you are a firefighter or Fire Chief, ditch digger or Executive VP of a major corporation, the insights in this book will help you to be better at whatever you do, especially if you already know everything..."
Anchorage Daily News "Whetsell recounts his adventures in an especially amusing voice.....bubbles with punchy remininiscence..."
Carol Reed, president, Alaska State Firefighters Association "Chief Whetsell's 'Fire and Ice' not only exudes his ever present wit and wisdom but it showcases what takes place in communities all across Alaska. The Alaskan fire service using their ingenuity and adaptability to respond in extraordinary ways to serve their fellow citizens ..."
Jill Fredston, author of "SnowStruck" and "Journeys Along the Arctic Edge" and winner of the 2002 National Outdoor Book Award "Dewey Whetsell spent half his lifetime responding to shipboard fires, blazing houses, car wrecks, medical emergencies, underwater incidents, and other disasters...he was the heart of the fire department." The Muncie Star "Whetsell's contribution to the safety of mankind is legendary in Alaska." 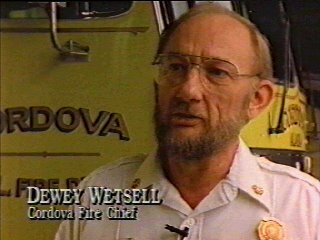 American Fire Journal article "Fire Chief Dewey Whetsell is one of the finest small-town chiefs in the country". Chief (ret.) Bud Rotroff, senior member of Alaska-DNR's Overhead Team "I love what he wrote about FEMA!" Chief Sam Bunge, Petersburg (Ak) Fire Department "After reading it, I bought another 10 copies to give to my officers, because of the tactics and strategies in the book."